For whatever reason (and I suspect some legal wrangling may have been involved) Sgt. Smasher isn’t the obvious re-release of Sgt. Slaughter. Instead, he’s an all-new character… or at least a new take on a peripheral character from the Sunbow episode “The Wrong Stuff“. In that episode, Cobra takes over cable television and introduces the Cobra Television Network which airs pastiches of then-popular television series with a Cobra propaganda twist. One such program was “The C-Team”, a satire of the 1980’s runaway hit The A-Team. That spot featured Mr. C – whose mannerisms and appearance were based on 1980’s pop culture phenomenon Mr. T. At the end of the episode, Mr. C realizes the error of his ways in siding with Cobra and instead asks to join the G.I. Joe team. Apparently he was successful and changed his name (and thankfully his hairstyle) and became known as Sgt. Smasher. The build for this Sarge should look familiar. From the neck down this is the camouflage Rise of Cobra Heavy Duty figure, a build that hasn’t seen extensive use since it’s initial release. It’s a functional body that gives Sgt. Smasher some bulk without having to reuse the Retaliation Battle Kata Roadblock figure yet again. Plus, we’re getting a brand new head and removable hat! New heads are NEVER a bad thing– especially considering that this is the final year of the Club’s existence. Is this the figure that fans were expecting? Probably not. Is this a bad figure? Even without having one in hand I’m going to say “not at all.” The odds of the Club being able to produce an actual Sgt. Slaughter figure for GIJoeCon 2018 were pretty long, given the complicated legal history of the Sarge’s relationship with Hasbro and the WWE. The brochure never claimed that this would be the familiar Sarge we all know and love– instead referring to Sgt. Smasher as another DI. So, while there is ultimately some disappointment over not getting Sgt. Slaughter in a Slaughter’s Marauders-themed set, we’re still getting a brand new character with a brand-new head and that’s fine with me. Let’s just hope the final product is as promising as the preview. This entry was posted in News by Fred Meyer. Bookmark the permalink. Mr. C has nothing to do with it. The Club actually got quite cute here – the figure is (really obviously) based on Sgt. Craig “Pitbull” Pittman, who wrestled in WCW in the mid-90s. The haircut is even the same as the one he had in 1996 or so. 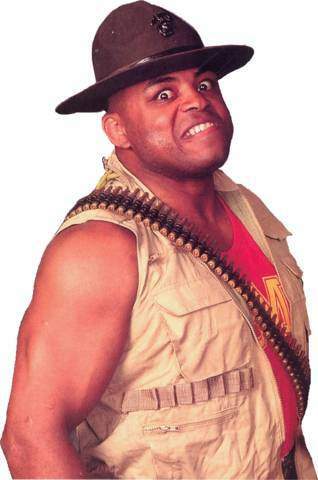 So instead of getting the premiere wrestling marine of the 1980s, they grabbed the most prominent one of the 1990s. Well, ok, second-most-prominent, after Road Dogg.